A medium sweet-sharp condiment made from the finest balsamic vinegar of Modena, infused with natural Blueberry flavour. The result is a deeply enriching balsamic, capable of enhancing a wide range of dishes. Can be used straight from the bottle as a dressing or as an ingredient in cooking. 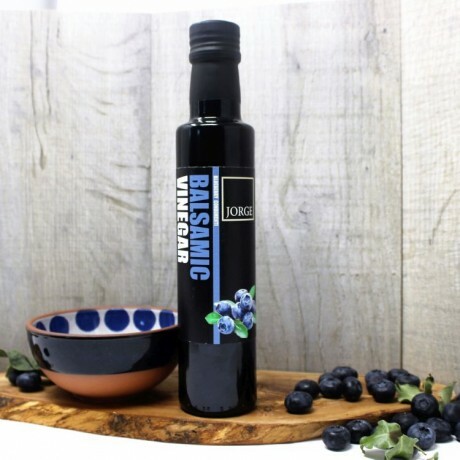 This beautiful Blueberry balsamic makes the perfect gift for aspiring cooks and is ideal for summer BBQs, mezze/tapas style dining or entertaining to impress. Fantastic straight over a salad, or for use in sauces, marinades or even desserts. Mix with Jorge Lime Olive Oil for a divine salad dressing. Jorge Balsamic vinegars are produced on a family estate in the ancient City of Modena, and are aged in the traditional manner using oak barrels. Modena is regarded by many to be the only place in the World to produce “real” authentic Balsamic vinegar, hence its name. Great product and service. Thanks! Good product, speedy delivery and prompt after Service answer to my query. Thanks! What a find this Company was, only just ordered and received my first items of speciality vinegars (pomegranate and raspberry) you will never go back to plain old malt vinegar after tasting these. Arrived in good time, beautifully packed and I look forward to browsing for more things very soon. This product is dispatched by Jorge Artisan Foods. This item has a shipping weight of 645g. A family business boasting a selection of unique naturally infused olive oils and fruit balsamics.